As part of my role on digital capability, I'm experimenting with different ways of delivering learning activity to people within the department. The traditional course is fine as far as it goes, but with increasing limits on both budgets for learning and development and time to take out to attend courses, we need a blended approach that doesn't rely on just one method. 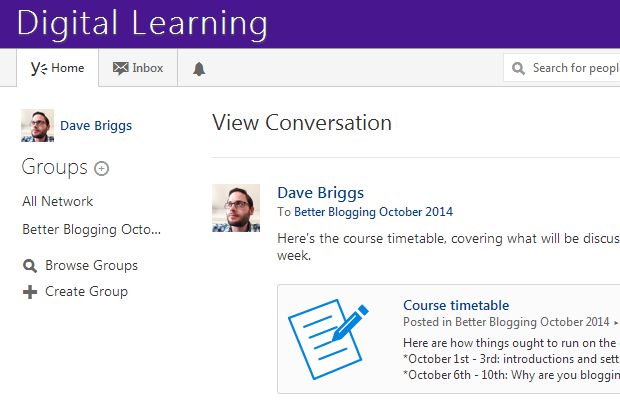 One new experiment, which is kicking off this week, is using Yammer to deliver an informal learning course. In case you don't know, Yammer is an internal social networking tool that provides a Facebook like experience only accessible to people working within an organisation. It's what I was alluding to when I wrote on my personal blog about using tools you already have, rather than always building something new. So, I have created a new Yammer network to run alongside the usual DH one - this keeps all the learning stuff from cluttering up the main one. Also it means that in future, people from outside the department could take part if we decide it would be a good idea. Inside this new network, the structure is that each 'course' will sit inside its own group. Anyone can join the network, but course group membership is moderated to help manage numbers and so on. The first course I am running, which starts this week, is for members of the digital team who want to improve their blogging. The format is that it is a four week course, with each week being a 'lesson'. The lessons are made up of bits of content, including stuff to read, videos to watch, and guidance to download. Discussions will be prompted inside the group to help talk through issues and embed learning, and there will also be a simple assignment each week. The weekly format will mean that not everyone has to be online and interacting at the same time, whilst still getting the benefit of conversations with fellow learners. I'll be doing some simple evaluation of this method of delivering learning in the Department, and if it proves to be something people find helpful, I'll be doing more of it. Hopefully it's also a model that others will be able to follow, and I look forward to reading about how that works out. Whilst this is generally laudible, I wouldn't be too quick to dismiss classroom learning (the first point about 'in context'). Classrooms provide shared learning and opportunities to discuss the learning underway (i.e. face to face and with body language). Learning styles vary from person to person, day to day and subject to subject... and continue in the corridor afterwards! Agree with you Andrew - hence my reference to "we need a blended approach that doesn’t rely on just one method". Not relying on one-size-fits-all approaches is key - hence experiments like this one. How does one withdraw a comment in order to correct a typo?! We were discussing this issue in my team earlier this week, and would love to be able to produce training videos to share on the schools extranet, but we're not sure how we would go about it , or what technology we'd need- any helpful hints ? Very interested to read about how you're delivering informal training via Yammer as it's something that we've been doing too as part of our blended learning approach to training in the Scottish Goverment Library for our SG colleagues and for others in the public, education and voluntary sectors in Scotland. We've set up 2 Yammer groups ( though we might merge them into 1) to deliver self directed bite size learning on social media and information skills. It's called '10 Things' and runs for 10 weeks and is administrated by us. Here's a Prezi we've created to show what our 10 Things course is, what we did and why we did it. The next course starts on 5th January 2015. All welcome! I've had several experiences of using Yammer for online learning - however in my experience people find it quite chaotic.. It is hard to structure. I used tags to create links and created an overview in a note. I thought that would help. And on top of that I send emails every week of every day. Curious what your experiences were?